Rare and unusual plants that are more often found on prairies in the Midwest or in the Appalachian mountains also flourish in and around Penny’s Bend Nature Preserve on the Eno River in eastern Durham. The area is known for its spring wildflower displays, exceptional trees, and Piedmont savannas. At Penny’s Bend, the Eno River takes a huge horseshoe-shaped loop to the south as it detours around a sill of hard diabase, created when fractures opened by the separation of North America and Africa allowed molten rock to intrude horizontally into the surrounding bedrock, where it eventually cooled. The Triangle typically has acidic soil, but diabase weathers into almost neutral or circumneutral soil, meaning nutrients are more available. 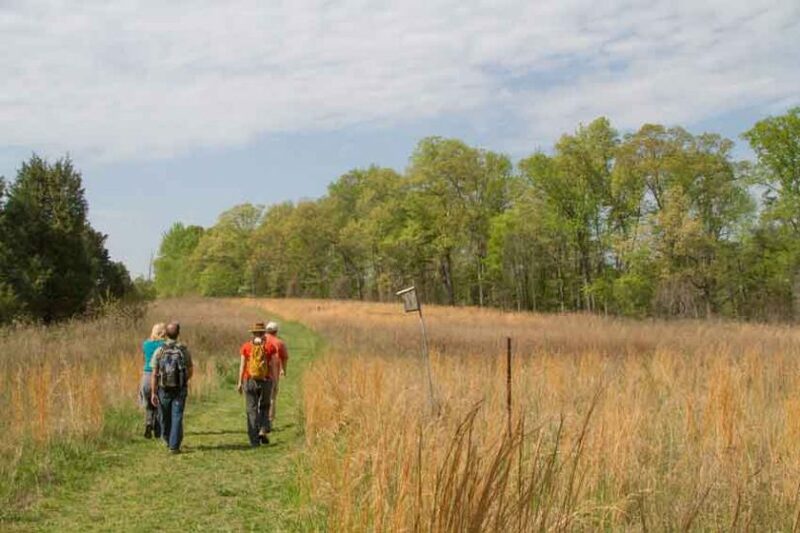 The Army Corps of Engineers owns the preserve’s 84 acres, but the North Carolina Botanical Garden (NCBG) Foundation manages it. The name Penny’s Bend first appears on an 1890 map, but who Penny was is lost to history. There are a number of interesting hikes to explore the floral wonders at Penny’s Bend. Near the rapids upstream from Old Oxford Road near Cameron’s Mill look for rare prairie disjuncts, such as blue glade wild indigo, orange-flowered hoary puccoon, and pink smooth coneflower, a Federally endangered species. The NCBG also propagates these plants to reinforce the existing populations. NCBG Director of Conservation Programs Johnny Randall says summer is the best time to see these flowers. The Pyne Trail, part of the Mountains-to-Sea Trail, skirts the river. Plants and trees here include hackberries, the larval food of several butterflies, American elms, ash, boxelders, sugar maples, elderberries, and hornbeams that shade painted buckeyes. Huge muscadine vines hang suspended from the trees. Forb plants include Christmas ferns, pink wood sorrel, a few Solomon’s seal relatives, both evergreen and deciduous wild gingers, green-and-gold, violets, jewelweed, and milkvine. Plants resembling goat’s beard grow by the trail map. The trail is rich in native flowers, especially towards Penny’s Bend Bluff at the far corner, but there are also many non-natives. Gill-over-the-ground or ground ivy is the showiest non-native, its blue flowers attracting bumblebees. Cash’s Point Trail, named for the last private owners who specifically wanted Penny’s Bend managed by the NCBG, crosses the peninsula diagonally. The path cuts through the largest fields with broomsedge, Indian grass, glade wild quinine, wild strawberries, yarrow, and other grasses and herbs. Dogwoods and redbuds glimmer on the edges. Large red cedars are one of the first trees in the succession from field to forest here. Tuliptrees, cranefly orchids, and agrimony can be seen at the wooded eastern end. The Natural Heritage Trail crosses an open forest on a rock-strewn bluff with an outcropping overlooking the Eno known as Little Blowing Rock. Resurrection ferns cover a boulder and there is lavender Hepatica, blooming as early as December to January, and sprigs of coral honeysuckle. Continuing along the river, there are native azaleas, probably pinxterflowers. Stands of buckeyes attract bumblebees and hummingbirds. The diverse herb layer includes yellow trout lilies, spring beauties, dainty white rue anemones or windflowers, toothworts, showy star chickweed, Dutchman’s breeches, mayapples, bluets, saxifrage, alumroot, yellow violets, mosslike Selaginella, and more. White woodland asters and green-headed coneflowers bloom later in the summer. You can hike at Penny’s Bend on your own or take a guided hike offered by the Eno River Association or the North Carolina Botanical Garden. For more information, visit enoriver.org. Featured image by Hoffman Nursery, Inc.
Michael Pollock is a writer who gardens in Durham. He has written for publications such as The Durham News, Carolina Gardener and Chatham County Line.